Do you know someone with an available small plot of ranch land in the Denver area? Belay Enterprises, has identified a great opportunity for a business that both employs and serves the refugee community in Colorado. A local Nepali pastor has approached us with the employment needs of his community. There are a number of older members who are struggling with learning English, which is negatively impacting their ability to find work. The pastor has also noticed that his community prefers buying whole farm-raised goats over pre-packaged meats at the supermarket. He's also discovered there is a great price spread between purchasing the goats in other states and then selling them individually in Colorado. But the difficulty with the model is finding an affordable place to ranch the goats close to Denver. This goat business model is also an opportunity for other communities in the U.S. and in the right developed nations. Our research shows that even non-immigrant communities are increasingly demanding direct from farm meats because of the health benefits. Our search for ranch land is part of Belay Enterprises' efforts in its Venture Partners Program to help start-up businesses that transform lives. 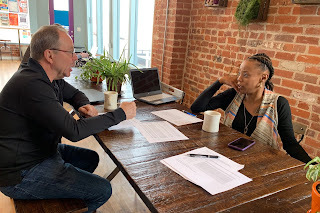 We are matching passionate early-stage Christian founders who desire to change lives through their businesses with mentoring groups of 3-5 business leaders. In addition, selected founders receive a start-up financial investment focused for business growth. All together, this investment of mentoring, technical expertise, and financial resources aims to increase the impact and effectiveness of the new ventures. Please visit here if you know someone who might be able to help out with the ranch land needs or if you want to learn more about our Venture Partners Program.